Martial arts apparel and lifestyle brand Form Athletics is raising the bar in the MMA industry with fighter-inspired apparel that blends performance, style and function. 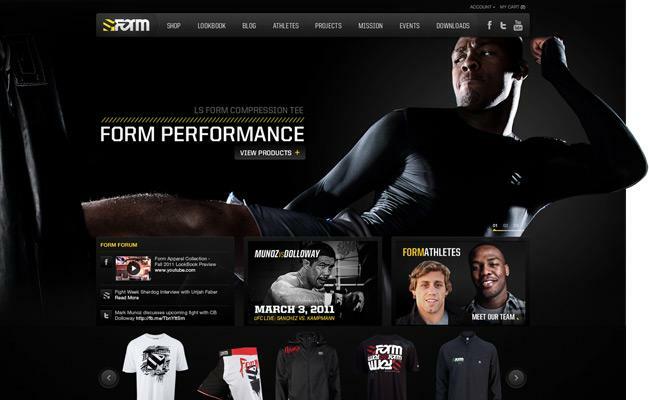 The new line of products, showcased at www.FormAthletics.com, brings a fresh approach to MMA fashion as the industry evolves from a niche martial arts culture to a global phenomenon. A division of K-Swiss that was founded in 2010 by Action Sports veteran Mark Miller and WEC former Featherweight Champion Urijah Faber, Form Athletics has carved out a strong presence in the MMA scene in a short amount of time. Already, the company has an elite team roster of mixed martial arts athletes including Urijah Faber, Jon Jones, Anthony Pettis, Mark Munoz, Chad Mendes, Joseph Benavides, and Scotty Jorgenson. From the beginning, the brand’s goal was to leverage its industry credentials to elevate MMA fashion and the lifestyle as a whole. Form’s branding moves beyond the aggressive and graphic-heavy look that had become a staple of the industry to a clean, modern design that incorporates the best elements of MMA culture, including athleticism and tenacity. In 2010, Form selected digital agency Cuker Interactive to grow their existing online business with a Web platform and eCommerce store that would take the brand to the next level. “Form had a clear vision to be a leader in the athletic industry and with the right Web infrastructure and targeted social media strategy, we knew we could help them get there,” explains Aaron Cuker, CEO and founder of Cuker Interactive. The new www.FormAthletics.com site blends performance and aesthetics to embody the athletic spirit of Form, with detailed athlete bio pages, professional videos and an events calendar for upcoming fights. The eCommerce store features advanced functionality like user accounts, gift cards, social media sharing integration, and a streamlined one-page checkout for quick and easy shopping. With a fresh style and polished approach, Form is helping to redefine MMA fashion and elevate the industry as a whole.